Life in Bangkok is a little crazy. Ten million people make it one of the world’s bigger cities and its streets could be like those in just about any big world city. Nights are loud, traffic is wild, and the mix of people, tuk-tuks and vivid lights add to the mystery of this Asian capital. 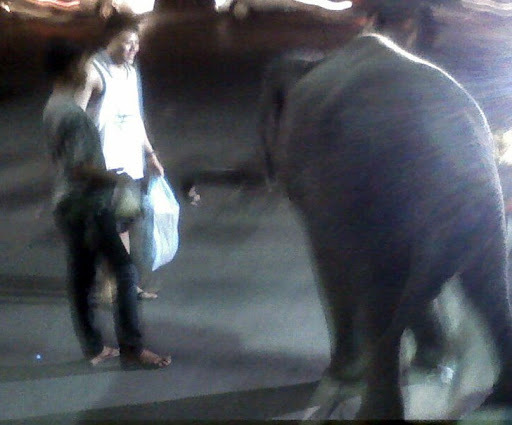 Tonight as we were walking back from dinner we came across a sight you wouldn’t expect in most large cities…a baby elephant out for a stroll entertaining the residents. Although the camera in my phone isn’t the best, you can still get an idea of that interesting sight. How cool is that!!! Hope y’all are enjoying your trip! We’re thinking of you! Take care!